The Peanut Shoppe – Why Charleston? 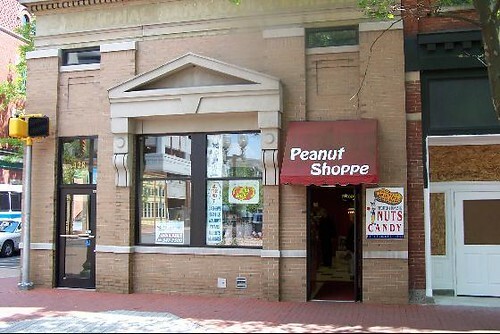 One of the well loved establishments in Charleston, WV, The Peanut Shoppe has become a tradition amongst the locals. Opened in 1950 by Delbert Moore, it was initially a Planters Peanut Shop. The shop is still owned by the same family, with Delbert’s grandson Adam Kimble taking the helm. It continues to stand proud in its original location along Capitol Street — even the chrome plated cylindrical peanut roaster is still rooted to the same place when the shop opened its doors more than 60 years ago. While many of The Peanut Shoppe’s regulars are the natives of Charleston, many tourists and new arrivals are drawn to the shop by the enticing aroma of the roasting peanuts. Today, the shop not only sell peanuts, but a wide variety of nuts from all over the world, as well as candies and refreshing beverages.